In today's landscape, it's not unusual to see a young athlete have success before they reach high school. But for a 12-year-old athlete to win a state championship in a sprinting event, in a highly competitive state, and to set a World Age Group record in the process? On Saturday, Buffalo Tapestry Charter seventh-grader Jada Kenner accomplished those very things at the NYSPHSAA Indoor State Championships at the Ocean Breeze Facility in Staten Island, running to a new career best of 39.24 seconds for 300 meters -- although, in a sign that everything doesn't come that easily, she didn't get out of the 55 meter rounds. In doing so, Kenner captured a new World Age Group record for 300m, passing the Czech Republic's Anna Kerbachova, who ran the distance in 40.19 seconds in 2013. "I just always make sure I don't psych myself out before I actually run," she said. "I always want to go on the track and do my best before I make judgements because of someone's age." The performance also ushered in new expectations for the young talent, who joined a strong history of sprinters in the state who have won the event in recent memory, including the likes of Lanae-Tava Thomas, Halle Hazzard, Deajah Stevens and Kyle Plante. But the time isn't so surprising. It's been her de facto event of choice for 2019, and she's been carving off time since her first effort in December. Kenner went from early season runs of 42, 43 and 45 seconds in December down to progression runs of 41 and 40 seconds in January and February. When March hit she was ready to throw down, and she did just that over two weeks, hitting 39-seconds on the clock in three straight runs, starting from the Section 6 State Qualifier on Feb. 21 to the state championships on Saturday. "I'm very happy that I won as a seventh-grader," Kenner said. "When I was in sixth grade, I always had this dream to win and I was very excited I won and I was shocked when I saw that time." But it's important to remember that Kenner, who also owns personal best times of 7.27 in the 55m, 7.79 in the 60m and 25.40 in the 200m, isn't the fastest middle school sprinter to come along in recent memory. 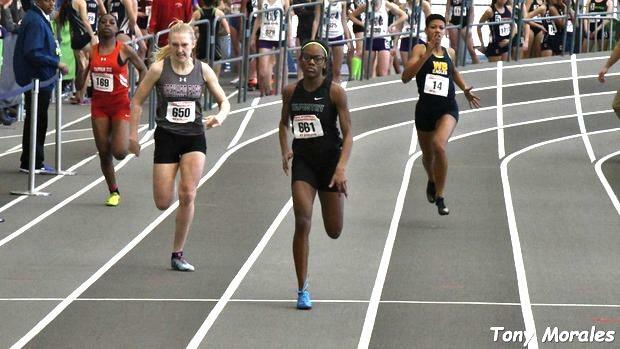 Two seasons ago, Madison Central (MS) seventh-grader Kennedi Sanders pocketed times of 7.72 in the 60m and 25.28 in the 200m across competition that indoor season. A year earlier, Tamari Davis ran a top seventh-grade all-time mark of 7.63 seconds in the 60m for Pure Athletics, a club based in Florida. Since then, Davis has exploded on to the scene as a talent worthy of competing at the international level. Sanders, meanwhile, has progressed very nicely in the two years since, lowering her career bests to 7.48/24.15/56.21 indoors. And yet, neither won a state title in their seventh-grade indoor season--though Sanders would go on to place second in the 100m and 200m at her outdoor state championships. Indeed, it's rare to find a seventh-grader with the ability to win a state title. Even as distances get longer, the margins rarely get smaller. In 2016, Farmington's Anna Fenske ran class best times in the 800m, 1600m and 3200m, though she did not win a state outdoor title in Minnesota -- she was seventh in the latter two races. Anna Jensen and Katelyn Tuohy dominated the seventh-grade leaderboards in 2015 and competed at a high varsity level at various distances, though neither secured championships in Michigan or New York. It speaks to how special Kenner's win on Saturday was. And the examples of Sanders and Davis are great case studies for Kenner, who find plenty of competition in New York in the season and years to come. With 11 more indoor and outdoor seasons left in her high school career, she will have time to go for more titles, possibly even a record or two. New York's state record in the 300m stands from 2013, when Kadecia Beard ran 37.54 seconds, though the state meet record is from 2012, when Colonie's Kyle Plante went 38.23. If Kenner has any aspirations of achieving great success, she should look right to the career of Deajah Stevens, a Benjamin Cardozo graduate who later went on to star at the University of Oregon (before a stint at junior college) before becoming an Olympian, a US Champion and a World Championship qualifier. She won an indoor state title at the distance in 2013. Coincidentally, Stevens ran the same exact time Kenner achieved on Saturday in 39.24 ...though she did it as a senior.